One Financial Plaza, also known as the Sovereign Bank Tower and formerly known as the Hospital Trust Tower, is an international-style skyscraper in the heart of downtown Providence, Rhode Island. 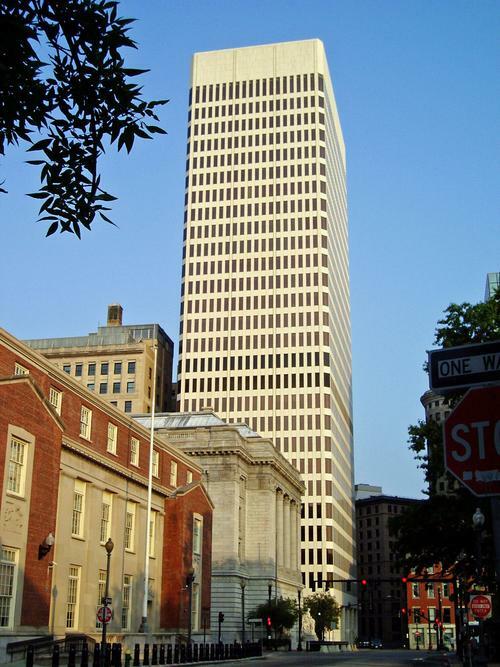 Standing as the second-tallest building in Providence, its taut-skin cladding is done in pre-cast concrete and travertine. The building is topped with a wide masonry cap surrounded by lights that glow orange at night; the light colors are changed to green and red for the Christmas holiday season, red for Valentine's Day, and green for St. Patrick's Day. Atop its roof is the highest helicopter pad in the state of Rhode Island. The Hospital Trust Tower was built to house the institution responsible for funding Rhode Island Hospital. William McKenzie Woodward, a well-known architectural historian and staff member of the Rhode Island Historical Preservation & Heritage Commission, does not agree aesthetically with the building, calling it a "lackluster addition to both the street and the skyline" saying that its "blunt mass" is made "all the more graceless" by its travertine curtain wall.